Cast: Matt Damon; Tommy Lee Jones; Julia Stiles; Alicia Vikander; Vincent Cassel. Content Rating: PG 13 for intense sequences of violence and action, and brief language. Jason Bourne is back. Except, he doesn't really need to be. This movie is pumped full of impressive action and more violence and more blood, but I can't get away from the fact that it felt unnecessary. The plot was extremely weak. The dialogue was rubbish. 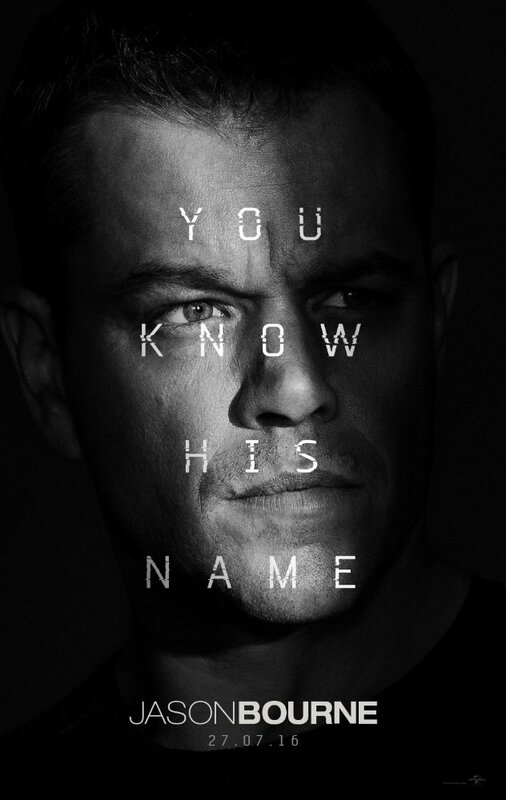 With the debatable exception of Bourne, every character was weak and one-dimensional. Despite heart-racing chases and fights, those scenes were only really repetitions of sequences we've seen so many times in the previous films. The cinematography was good, but it never stopped to breathe. Soon it just became a mess. I had to look away more than once because the camera was all over the place, totally disorganised, and the scenes were blinding as well as untidy. Far too busy. The new characters were boring and predictable. Damon gave it his best - and he was definitely good - but as soon as he stopped brooding and started shouting, it felt false and halfhearted. While he was brooding, however, he did evoke empathy. And made a good case for his anti-hero; which I couldn't help but feel sorry for. Alicia Vikander. What to say. I love her as an actress, and she's got excellent talent, but I honestly thought she was miscast in this film. Her refreshing presence was wasted on an unnecessary role that left any character development extremely limited, not to mention the character itself was basically just a plot device to try create conflict. Vikander just looked too young for the role of the character. She looked out of place and out of depth, and just got in the way. It was gripping and it was exciting. But the characters and the plot were pathetic, and I recommend re-watching the previous films if you want Jason Bourne. On side note, that death at the start was heartbreaking. It was also a stupid move on the part of the writers, and was clearly just there to try shake things up a bit. Lol. And I totally understand that :) You're right though, I guess it had to run out of steam sometime. I was never too interested in this series. I watched the first movie and then I have no idea if I even continued. It's all blurred tbh, because it was long time ago. But nevermind that, it's a shame that this sequel wasn't better. Sorry about that. But to be honest, I really didn't like the first one either; it was prob my worst favourite of the series. The Bourne Legacy and The Bourne Ultimatum were the best in my opinion. Yeah it was disappointing :( Thanks for stopping by! I was so excited for this movie and felt is was very underwhelming. I might even say unnecessary, like you said. I also agree Alicia Vikander (who I think has a lot of potential- I mean Ex Machina, come on) didn't work for me here. And the death of you know who- NO!! I love her as a character and she's way superior to Vikander's character. That pissed me off. :) I also think this film missed people like Pam Landy and some of them- Tommy Lee Jones ugh. Yeah I agree. And totally; Vikander is capable of so much more; after all, she won a Oscar for The Danish Girl, she's got serious talent. And OH YES that death hurt so much.....I didn't realise how much I liked that character until THAT CHARACTER died. I thought it was a really stupid move on the part of the writers, etc.